Leaders at the Texas Capitol love to bash what they call out-of-control bureaucrats at city halls and in Washington, D.C., but a recent case pitting the Texas Alcoholic Beverage Commission against Spec’s Wines, Spirits & Finer Foods looks like state regulatory overreach on steroids. After an investigation of the state’s largest liquor retailer, the TABC sought to yank permits for all 164 of the company’s stores — which would effectively shut it down — or hit Spec's with fines of up to $713 million, according to court documents filed last week. The agency also put the company’s expansion plans on ice by freezing Spec’s new permit applications during the three-year probe, records show. What did Spec’s, a family-run company based in Houston, do to deserve the business equivalent of the death penalty? That’s what a couple of Texas administrative law judges wondered last week. They poured out the TABC like stale beer in a blunt 151-page ruling. The judges said TABC failed to prove dozens of allegations, rebuked agency lawyers for failing to disclose evidence to their own witness (and the court) and called out the agency for “stacking” charges, a tactic commonly used to pressure defendants into a settlement. In the end, the multi-year prosecution and an eight-day March administrative law hearing — similar to a trial — turned up evidence that Spec’s may have paid a $778 invoice from a wine supplier a day or two late in 2011 under the complicated liquor “credit law” spelling out when payments for booze must be made. The sum total of the sanctions recommended by the judges: a warning, and no fines. TABC spokesman Chris Porter said the penalties described by the judges "are the maximum available penalties for the alleged violations under the Alcoholic Beverage Code," and added that "TABC never seriously pursued the listed sanctions and did not seek to levy such heavy fines or cancel all the permits for all 164 Spec’s stores." The judges have given Spec's the green light to start expanding in Texas again. Spec’s, meanwhile, is on the hook for “north of a million dollars” in legal fees, court fees and other costs, said Al Van Huff, the company's attorney. That doesn’t count the scrapped plans to expand and grow at time when out-of-state chains like Total Wines are adding outlets in Texas. Spec’s is expecting the TABC to ask the State Office of Administrative Hearings to reconsider at least some of the judges' findings. If that doesn’t happen, the regulatory agency has some discretion to change the proposed decision. But that would likely trigger more legal wrangling — this time in state district court. Porter, the TABC spokesman, said because the case remained open, the agency could not comment on the specific allegations or disclose what steps it would take next. But he said the TABC is required under law to "issue citations if an investigation uncovers evidence of an alleged violation" and that whatever the outcome, "the agency believes in the ideals of due process and rule of law." Van Huff said Spec’s is considering its own legal options, which could include a lawsuit against an agency already in the hot seat at the Legislature after a series of spending controversies and reports of abusive treatment of companies it regulates. Last week, newly-appointed TABC Chairman Kevin Lilly, tapped by Gov. Greg Abbott to help clean up the embattled agency, visited the TABC’s Austin headquarters, where he reviewed the personnel files of senior staff and conducted a series of closed-door meetings with them. Abbott’s office expressed concern about TABC’s handling of the Spec’s case and other matters. "The governor continues to be deeply concerned about the pattern of practice at TABC,” said Abbott spokeswoman Ciara Matthews. “The governor's office is actively working with newly-appointed Chairman Lilly, who has been conducting a top-to-bottom review of all personnel and operations to reform TABC." Spec’s lawyer was particularly critical of the TABC's auditing and investigations chief, Dexter Jones, who oversaw the Spec’s investigation, and TABC General Counsel Emily Helm. Van Huff alleged Helm abused her power in early 2016 by offering to get three new permit applications approved for Spec’s President John Rydman if the company would agree to settle the existing cases. According to court documents, the TABC said denying the new permits was justified because Spec’s threatened the “general welfare, health, peace, morals and safety” of Texans due to the concerns raised in the agency’s probe. An email seeking comment from Helm went unanswered. Porter, the agency spokesman, said Helm "disputes the wording of this quote" and "any assertion of unlawful conduct." "Such settlements are offered (often multiple times) during the course of any administrative case in which TABC is involved," Porter said. "This is a common, lawful practice for any administrative or civil court case." The case against Spec’s started with an audit of the retailer’s operations that began in February 2013. Two years later, Van Huff and Rydman, Spec's president and owner, were summoned to TABC headquarters and given a “settlement agreement” proposing to fine the retailer $8.6 million, cancel 16 of its liquor store permits and agree to “enhanced oversight” for two years. Once Rydman and Van Huff started looking through the allegations, Van Huff said they knew there was no way they were going to settle. The TABC claimed Spec’s had illegally accepted millions of dollars in payments from both a wholesaler and a competing liquor store. A liquor retailer such as Spec's generally can’t receive money from those entities under the state's byzantine alcohol regulations, adopted after Prohibition was lifted in the 1930s, that strictly control who can own what piece of the alcohol business. In both cases, Spec’s said it could easily explain the payments TABC auditors discovered. In the case of the wholesaler, Spec’s had accidentally paid an invoice twice, so the money coming back into its account from a wholesaler was merely a refund of an overpayment; in the case of the competing liquor store, Spec’s was legally purchasing the store and using its merchant accounts during the transition process, Van Huff said. A phone call could have cleared up those supposed infractions, he said. “Instead of the auditor who was doing the investigation seeing something questionable and then asking us to explain it, they just made it an allegation in this settlement agreement as the basis for us to agree to write a check and to agree to all these settlement terms,” Van Huff said. The same dynamic — scandalous-sounding charges that didn’t survive a cursory check of the evidence — played out repeatedly during the March hearing. During the proceedings, TABC officials attempted to convince the court that Spec’s engaged in a pattern of behavior so egregious that it deserved to have all of its liquor permits canceled, the court said. But one allegation after another crumbled before the judges. TABC’s star in-house witness, Houston-based auditor Kathy Anderson, alleged Spec’s engaged in illegal price negotiations for wine. Her proof? Emails between a wholesaler and a wine maker discussing what price Spec’s might want to charge. But Spec’s didn't participate in that email exchange. Even more damaging to TABC was Anderson’s claim that one of Spec’s wholesalers, United Wine & Spirits, had “admitted” to violations that implicated Spec’s in a scheme to skirt liquor laws designed to keep alcohol manufacturers, wholesalers and retailers all in separate lanes. The supposed proof: an agreed-to “waiver order” — basically an acceptance of punishment — that United Wine & Spirits signed. That order was cited like a King’s X over and over in TABC’s case against Spec’s. A long string of allegations relying on that document collapsed when Van Huff asked Anderson if she had read the settlement agreement attached to the waiver order — which stated that United agreed to pay a fine to “resolve the contested allegations” but did not admit guilt. She said she was not aware of that stipulation. This was the gotcha moment of the trial. Van Huff: “So each and every time you refer to the waiver order and say it was United Wines & Spirits’ admission of wrongdoing that reflects poorly on Spec’s, that was all incorrect, wasn't it? Anderson’s admission came within the first few hours of the proceedings. It went downhill from there. When the TABC called United Wine & Spirits executives to the stand, the executives quickly threw TABC under the bus, testifying that although they disputed the agency's charges, they agreed to pay the TABC $100,000 to “make the case go away.” They calculated it would be cheaper and easier than fighting it out. The judges also ruled that the TABC “failed to reveal the contents” of United Wine & Sprits’ settlement agreement “to its own witness and to the [administrative court]." And they determined that — “contrary to [TABC’s] contention that the charges are not stacked” — the agency piled one allegation on top of another in a controversial practice that uses the same evidence for multiple charges. 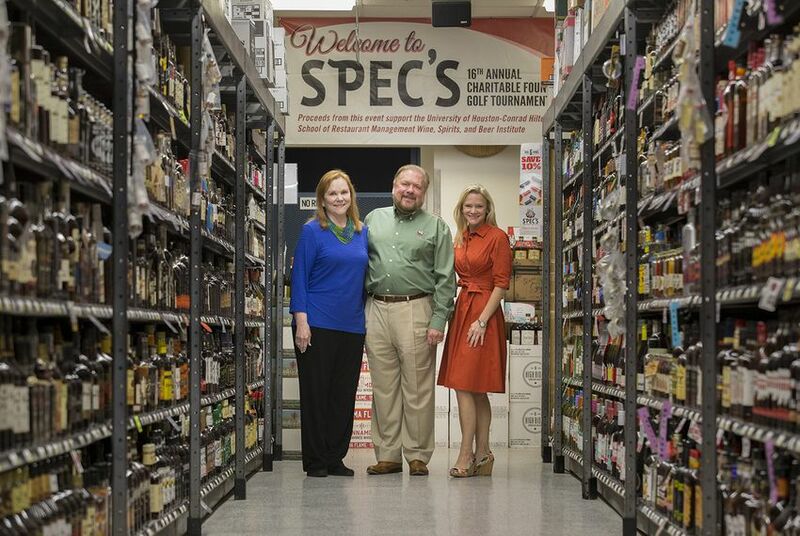 The TABC's legal Waterloo is helping to lift the cloud that has been hanging for three years over Spec’s, launched with a single store in 1962 by Rydman’s father-in-law, Spec Jackson. After the company branched out into upscale wines and gourmet food, it went on to become the largest liquor retailer in Texas and the second-largest family owned alcohol retailer in the nation, according to Rydman. Rydman, who began working at Spec’s in 1972, took the stand during the trial and recounted how the probe has taken a toll on his business. He said the company hasn’t been able to expand for three years, and earlier this year a landlord threatened to cancel a lease because he was unable to renew a permit.